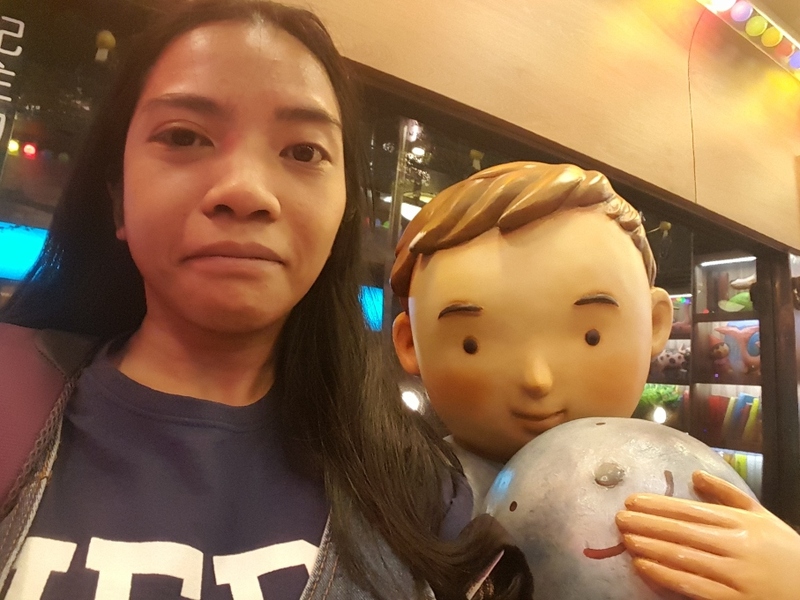 When I plan for activities to do during a trip abroad, I sometimes check out Tripadvisor for some recommended activities that I must not miss when I’m around the area. I was a bit excited to see the top attraction to involve some hiking (as I assume most people would tend to avoid physical activities lol). 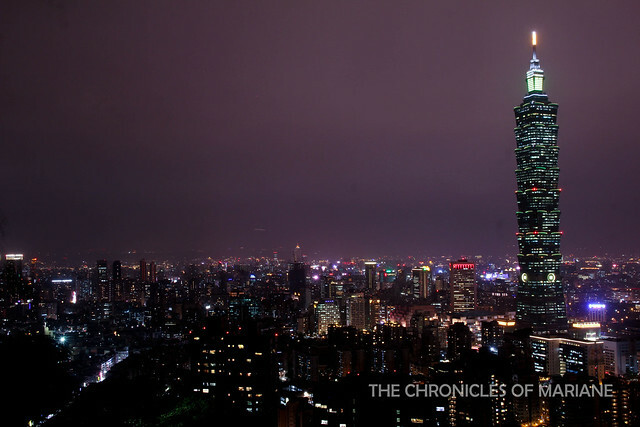 Nevertheless, I made it a point to visit the place during my first week in Taiwan not knowing what’s in store for me there. I initially planned to reach the peak of the mountain before sunset, because I didn’t want to hike up without sunlight. I remember reaching Xiangshan station which is the closest train station to the hiking trail, at around five in the afternoon, and it was so dark! It was technically autumn in Taiwan thus sun sets very early, and me being not used to four seasons didn’t consider this at all. 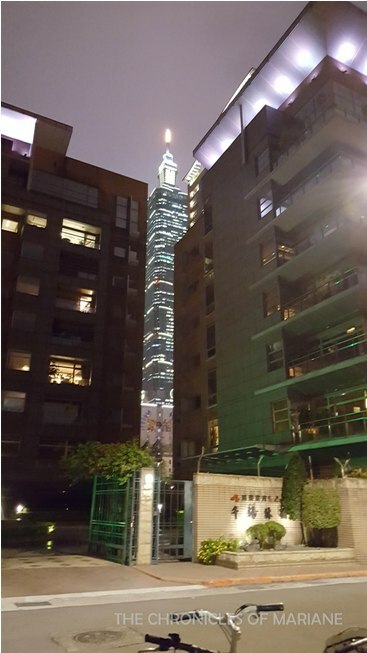 As I exit the station, I immediately saw signs pointing to Elephant Mountain which is also known as Nangang Hiking Trail, so it wasn’t difficult to locate at all. There are lots of these helpful signage in Taipei so if you’re bad at directions, then there’s no need to worry at all. If you are using Youbike, which is Taiwan’s public bike rental system, there’s a station nearby Zhongqiang Park. From the park, I remember turning left and seeing a temple. At this point, I didn’t see any signs but since there were stairs and people going down from there (duh), I assumed this is the start of the trail to Xiangshan. I estimate the walk from the MRT station to the temple took about 8-10 minutes. This was surely one of the easiest climbs I did in Taiwan, since you’ll get to the top in less than 20 minutes and it’s so accessible, however, if you dread STAIRS, then this trail has tons of it. 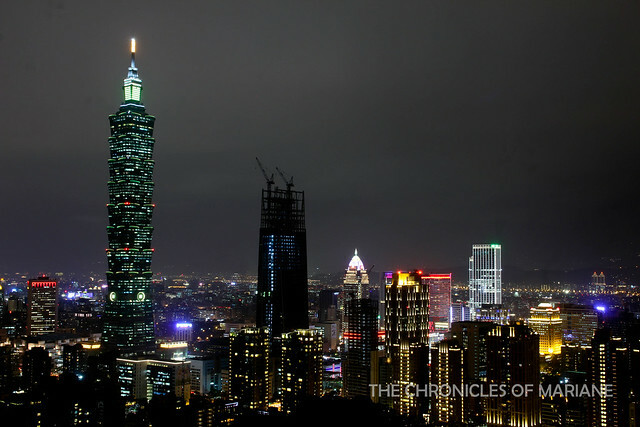 Actually, most of the recommended hikes in Taiwan are loaded with stairs, so expect your knees to cry out for help. 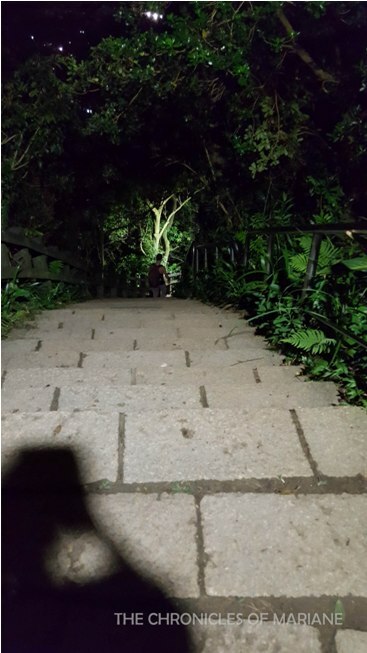 It was dark but no need to worry since most sections of the trail have lampposts so you’ll still see your steps. No need to bring a flashlight. The round trip trek could only eat around 20-30 minutes of your time but you’ll probably want to stay longer to enjoy the scenery. I absolutely had no idea why Elephant Mountain was highly recommended and I just did it because it took the top spot in Tripadvisor (it’s a good thing the thumbnail they selected for this picture were just leaves). I don’t like doing too much research and look forward to each surprise I’d get when I’d reach my destination. 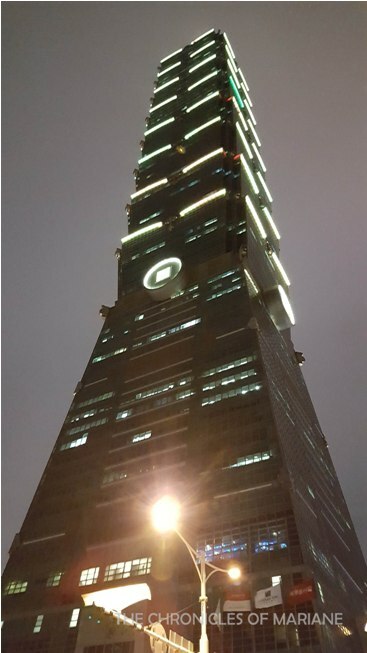 So imagine my reaction when I was climbing up and I realized this might be the best spot to get the bird’s eye view of Taipei! If there was one thing I would have changed, I would have brought a tripod or better lens. Anyway, you don’t really need to stay long around the peak, because you can get the best views at some viewing platform which I missed so I had to backtrack a bit. I noticed some huge boulders along the way, called as Rock Garden by some, and wondered why there were lots of people hanging out there, and turns out it is also a prime viewing spot. 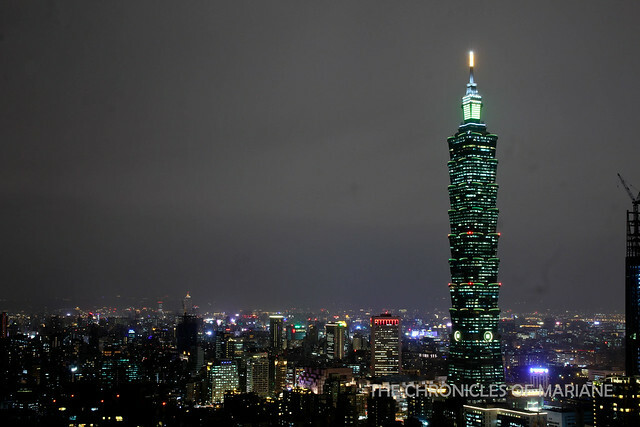 Just a few meters away from there, there’s a nice dedicated platform for those who want to appreciate this amazing nightscape of Taipei and take tons of pictures. panoramic shot from my phone, not that bad, eh? As I wam doing research for this post, I found out that the Elephant Mountain is just one of the "Four Beasts 四獸山" , including Leopard, Lion and Tiger to complete the circuit. I wish I knew about this prior to the trip so I could have gone on an early morning to explore the rest of the trail since the rest of the path gets more challenging. Think of ropes, rough climbs and slippery rocks. 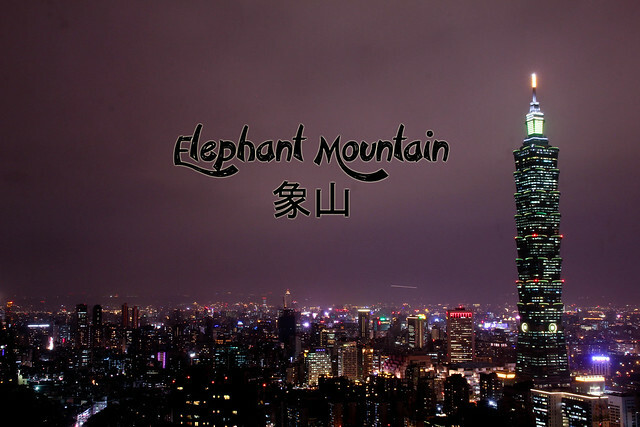 So did I figure out why Elephant Mountain (Xiangshan 象山 in Mandarin) was named as such? Nope. 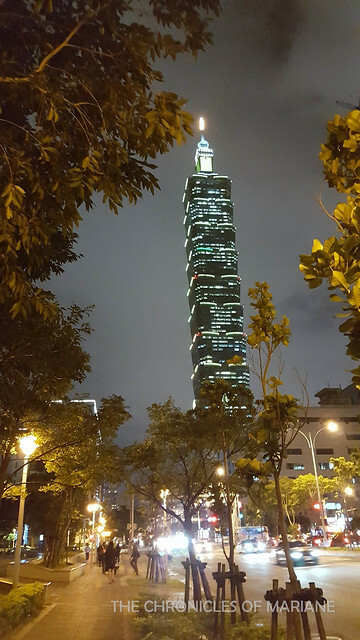 It was too dark already so I didn’t really see how it resembles an elephant, so I just marveled at the massive Taipei 101, considered as the world’s tallest building in 2004. Its spot was later on taken by Dubai’s Burj Khalifa five years later, but it is still no doubt a magnificent structure. This skyscraper is almost synonymous with Taiwan, to the point that when I told some friends that I’ll be going to Taiwan, they would always reply with “Oh, you’re going to see Taipei 101, right?” Yes sir, definitely. 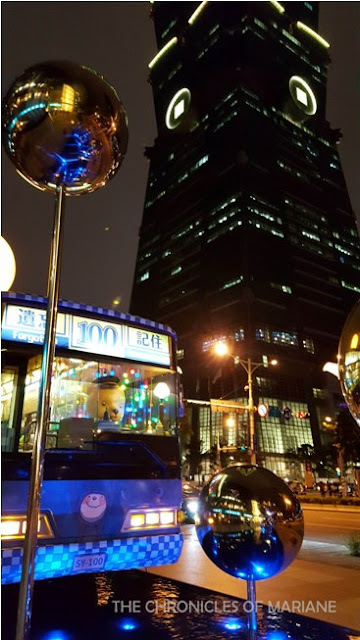 This landmark sure adds extra glitter to lively night scene of Taipei. From the park, it’s only about 20-30 minutes of walk to Taipei 101, so no need to ride up the MRT again if you want to see this enormous skyscraper up close. 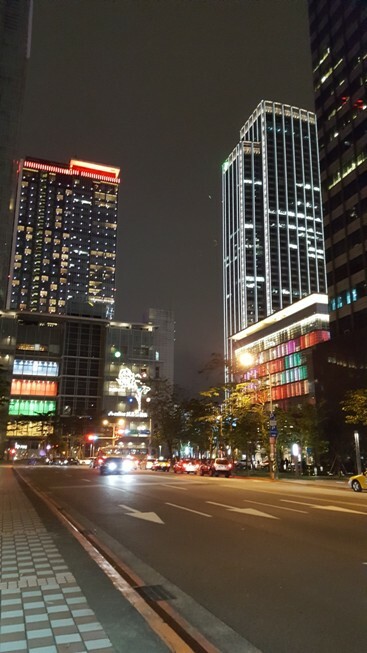 Xinyi District also looks amazing during nighttime so I highly suggest walking around the area, if you are into buildings and whatnot. It’s interesting to see the contrast and how it changes as soon as dusk sets in. If you only have to do one hike in Taiwan, Xiangshan is your best bet. 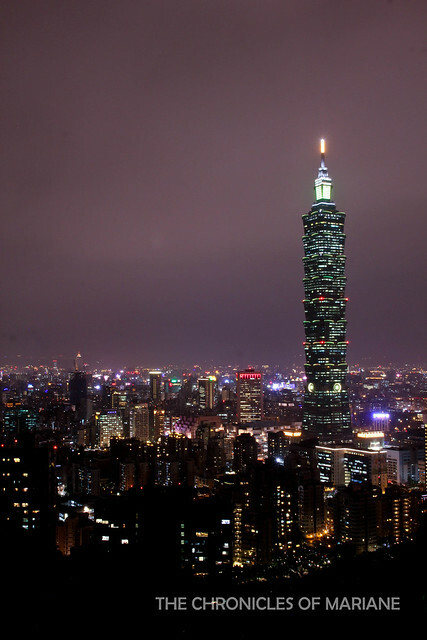 Aside from the convenience, the rewarding vista of Taipei will surely be worth your while. 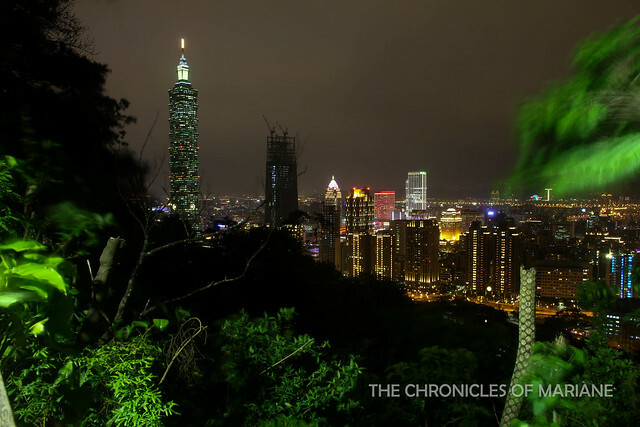 So reserve your energy, eat a filling meal, and let’s go up Elephant Mountain!